• British researcher provides incontrovertible evidence of the New World Order. If you’ve ever wanted to examine whether the New World Order is real or just the stuff of conspiracy theory, it’s time to check out the work of prolific author Dr. John Coleman. Besides authoring over 25 books and over 400 white papers on subjects AMERICAN FREE PRESS and its forerunner The Spotlight have covered over the past four decades, Coleman is a constitutional scholar, museum researcher, historian and lecturer. 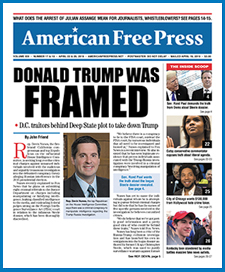 In a first-ever offer for this newspaper, Coleman has made three of his most popular books available to AFP readers for a discounted price: The Illuminati in America, The Rothschild Dynasty and Beyond the Conspiracy: Unmasking the Invisible World Government, the Committee of 300. Coleman also answered questions from this AFP reporter regarding his life’s work. AFP asked Coleman how his background prepared him for his writings. “I read documents at the Balliol College Library at Oxford,” he told AFP. As an indication of the closed society at the University of Oxford, it is clearly marked on the library’s website, “Library for College Members Only.” Oxford’s origin date is unknown, although there is evidence of its founding as far back as 1096, making it the oldest university in the English-speaking world, and the world’s second-oldest surviving university. Established in 1753, the British Museum in London has a permanent collection of 8 million works and is one of the largest and most comprehensive in existence, with books from all continents, illustrating and documenting the story of human culture from its beginnings to the present. Nearly 7 million people visit each year, making it the UK’s most-visited museum. AFP asked why Oxford and the British Museum were important to this matter, and whether or not this topic could be researched in any library. AFP asked what subject matter Coleman researched in the Congressional Record. “The United States Constitution,” he answered. AFP asked what transpired for Coleman to take pen to paper to expose the New World Order. AFP asked if the forces Coleman writes about have grown stronger since he first discovered them, and if he suspects they will be successful with their plans. AFP asked what an average person can do to halt or slow down the elite’s progress. AFP asked if he believed there were any honest U.S. politicians left. 1. The Illuminati in America, softcover, 82 pages, $14. This book, which covers the period from 1776 to 2008, is a graphic account of how the Illuminati exercised its power ever since its founder, Adam Weishaupt, wrote its charter in 1776. “Kings, presidents and dictators have all taken direction from the Illuminati, which is very well established in the U.S. today,” writes Coleman. Johann Adam Weishaupt, born 1748, was a German philosopher and founder of the secret society Order of the Illuminati. Its 11 chapters cover the Illuminati’s founding, the 13 families who control the Illuminati in America and the top Illuminati families in the country, how to notice signs of an Illuminati presence in the U.S. and understanding how they cover their tracks. 3. Beyond the Conspiracy: Unmasking the Invisible World Government, the Committee of 300, softcover, 233 pages, $25. This book reveals in 16 chapters the shadow organizations that call the shots, “not [the elected] professional politicians or brilliantly dressed ambassadors. . . . The unknown men who take part in these councils are high financiers who are superior to vain ephemeral politicians.” Some of the topics covered in detailing the committee include the narcotics trade, the role of the military, the Federal Reserve coup d’état, the conspiracy of free trade, war and paper money. Read the comments. Click on the links. These “scholars” cannot even figure out that all the masonic “secrets” are based on the ancient astronomy of repeating cycles and destruction of Earth, rebirth and renewal of civilization after civilization. These ignorant “scholars” like Coleman can’t see that USA masons follows the Maya-Aztec pattern and sacrifice of people. These amateurs cannot figure out a such simple masonic symbols as one the ONE DOLLAR BILL: 52 Latin letters matching the Maya calendar: Annuit Coeptis + E Pluribus Unum + Novus Ordo Seclorum + MDCCLXXVI =52 Latin letters! It Means: Heavenly Conception + Many as One + New Order Sertain (Secured) + 1776. The RED Khazars used May 1st as MayDay. Blue Khazars, 1776…(Red Republicans + Blue Demonrats and their Luni-Solar Congress and Senate with Red and Blue ties). The famous Codex Mendoza reveals the Seven and Nine constellations at the END OF OUR CIVILIZATION. (7WTC buildings and 9 Columbus Circle Project buildings in Seattle-East-West path of solstices). Plus, the central column of Codex Mendoza reveals the current Galactic alignment of the phallic Belt of Orion (Min) and yonic Black Hole (Yama), both in the architect of the Twin Towers, Minoru Yamasaki from Seattle. The Galactic double center is depicted on Codex Mendoza as 9 starred Jar/Pot with 11 stars inside the Jar, 9/11 (= 20, the Maya vigesimal system of counting). The Zionist-masonic USA flag has 9 rows of stars and 11 columns of stars. There were 9 + 11 crew members with pilots attacking the Twin Towers! And 6 + 7 in Flight 77 and UA 93, since the Black Hole (and the Double Center of our Galaxy known as cosmic WOMB) is the 13th LAYER OF MAYA HEAVENS, as the 13th house of zodiac! The reason why the masonic-cabal selected 13 stars at the start, on 13 stripes! 9 x 13 = 117, the basic Maya calendar number! The Twin Towers each had 117 floors in total (110 above and 7 below ground), and each Tower stood on 117 steel columns! The Yiddish Manhattan island with its badly Battered Park is a local Zionist-talmudic-masonic copy of Dark Rift (Mesopotamia) in Milky Way—heavenly queen and goddess bowed over the sky arch/copula. Visit on Google: Bloody Zionist (Masonic) Fingerprints Left On 9/11 Crime Scene! Due to years of lies, there is much misinformation regarding the New World Order. Unfortunately, people are being programmed to accept a global slave state through the media, Hollywood, the educational system, and even video games. By educating yourself, you will be able to see though the lies and keep the world from becoming a global slave state. What these people don’t realize is that even though they believe that their plan is flawless and will succeed, there is a higher power that has a plan also, and he has set in place the men and woman who will rise up and fight, and their passion is freedom and the will to fight that is a factor they seriously underestimate. I have a saying: Evil thrives when good men do nothing, its time to do something. God bless America. Obama and Church Leaders PRAYED you’d never see this short independent documentary that has Obama on the edge of a nervous breakdown because it exposes the biggest cover up of his presidency. Something darker and more sinister than Sandy Hook and Benghazi combined. And it’s spreading like wildfire all over the Internet. Analysts warn it’s going to devastate millions of families, especially those with children. Stay safe, be prepared. P.S. More than 147,539 Americans have watched this video before it was taken down the first time. Now they managed to get it online again. Check out the video before it is taken down permanently. The sheeple in America for the most part are ignorant to the truth and don’t want to believe that their government is so corrupt, that we are under martial law/police state. It’s awfully funny that the only two responses to this article, who try to go after the credibility of the author, do so anonymously. Promoting the likes of Coleman is certainly an excellent way to cast further doubt on the credibility of the AFP. Coleman is a liar. His books are turgid and garbled and he has been accused by other researchers of cribbing their work without acknowledgement. Among his tall tales are that he was the first to have revealed the existence of the NRO and the Club of Rome. And the softball questions in the so-called interview were as embarrassing and unprofessional as, say, a “reporter” from Executive Intelligence Review asking Lyndon LaRouche how brilliant he thought he was. Didn’t Coleman once claim that The Spotlight was a “soviet-financed black propaganda publication”? It’s disheartening that the AFP would be promote someone who made such a baseless accusation about its predecessor.